The following herbs index has been carefully compiled to include the most common and important list of herbs. Most plants, trees and weeds have medicinal properties that have been used or can be used to heal the body and aid in the management of symptoms. 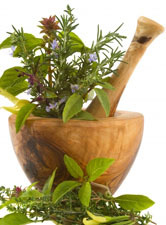 It is well known that the origins of our pharmaceutical industry comes from nature, more specifically herbs. In our society today, more and more people are becoming aware of the benefits of using the abundance of resources in nature for their therapeutic properties to help cope with ailments and health complaints. Below is a list of herbs and articles to support you in your efforts to find natural means to a healthier life. Hope the herbs index was helpful!